As a private attorney who’s responsible for bringing in new business, I often think about why businesses need to hire an attorney to help with their contracts. Here are some thoughts about how I view my role in business transactions. Not all law practices are alike, but I usually operate in one of two contexts: either I’m dealing with a senior business executive (usually the CEO or the owner) of a company that doesn’t have in-house counsel, or I’m basically doing overflow work from the general counsel’s office of a largish corporation. In those cases, I’m usually dealing with someone in the sales division of the company on each contract, although I’m hired by the general counsel or another senior attorney. My role is similar in each context, but when I’m hired by a general counsel’s office, I often have a gatekeeper function that’s missing when I’m dealing directly with principal business executives. Sophisticated corporations tend to enforce their contracting and risk-management policies through the general counsel’s office, so when I work for the general counsel, I usually have a certain amount of delegated authority to ensure that the corporation’s contracts that I review conform to policy and that exceptions are appropriately vetted. In other words, the business people need my approval before they can enter into a contract. In all cases, though, I view my principal function as keeping time bombs out of my clients’ filing cabinets. 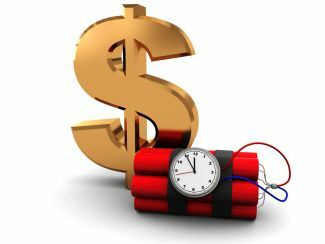 Time bombs are critically unfavorable contractual provisions that are ticking away, unbeknownst to the business executives, until they explode to the (sometimes catastrophic) detriment of the company. We often categorize contract issues as either legal issues or business issues. For example, whether payment terms are up-front payment, due upon receipt, or net 30 days is typically a decision that business folks make. In contrast, indemnification provisions are usually considered legal decisions that are left to lawyers to haggle over. Ultimately, though, all decisions about contract provisions are business decisions. And my role is to make sure that the appropriate decision-makers within my client’s organization are aware of the issues that are material to their decision. Important provisions my client isn’t aware of: time bomb. Important provisions that my client decides to accept, considering all the business and legal issues involved: an informed decision. It’s ultimately up to my clients to make intelligent decisions. It’s up to me to make sure they’re making informed decisions. What do you think is the role of the commercial attorney? Brian, that’s the best short description of what transactional lawyers do that I’ve ever seen. I’m putting a link to this on my own blog. Thanks, Vance. That made my day. It is very different however when it comes to lawyers dealing with China. Only Chinese lawyers are permitted to work on Chinese law. No foreign law firm is permitted to actually issue opinion on matters of Chinese law. What they can do – provided they are approved by the Chinese Ministry of Justice (for the list of China approved and licenced foreign law firms, see here: http://www.china-briefing.com/news/2014/03/24/foreign-law-firms-registered-china.html) is employ Chinese lawyers to do that work for them. Foreign law firms cannot sign off on Chinese contracts, period. Only Chinese lawyers working either for Chinese or Foreign law firms approved by the Chinese Ministry of Justice can do this work. As for foreign law firms based overseas (such as in the United States) trying to do China contractual work without being registered with the Chinese Ministry of Justice – that’s a total no go area. It just leaves you wide open for taking unauthorised advice. If its incorrect (as it very well may be), and you wish to take action, your legal insurance claims may well be invalid as you used an unlicensed practice for legal advice. Make sure that when it comes to China especially, the law firm you intend using – foreign or Chinese – is registered with and approved by the Chinese Ministry of Justice.